Entry filed under: Academic Centers, IB Programs. Tags: cps 2014 academic center letters, CPS academic centers, cps international ib programs, International IB Programs, lane tech academic center, taft academic center, whitney young academic center. Any ideas on when to expect them? Saturday or Monday? . . .and Lincoln and Ogden, the International Gifted Programs that start in 6th grade. I checked CPSOAE and couldn’t even find last year’s round one cut off scores. This year, the high school letters were mailed on a Friday and started arriving on Saturday. I hope it’s the same for AC letters. Good luck to all. Do you get the acceptance letter from the school as well just like high school? Crossing my fingers for all the kids today. @cpsmom, so does your 6th grader actively want to go to an academic center next year? Hi all…..does anyone know if the acceptance letters go out in an order according to which child had the highest scores to the lowest scores. @Je’Taun, I don’t know if there is a certain way they are sent. I think they all get mailed out the same day regardless of your child’s score or if they got an offer. I believe the go out on the same day (or as close as possible given it’s thousands of letters.). It may sometimes seem that the first people posting here have high scores or acceptances, but I think that may be more an indication of the parents who are more “obsessed” about the process. @CPSO: She has wanted to go since her sister was accepted into one at this time last year. She has really really REALLY wanted to go since her sister actually started going and she saw the challenge and reward (of being in class with kids who take school seriously yet have fun while doing it). I’m sending every parent good vibes and peaceful thoughts. This crappy system has turned parents against each other while we are fighting for too few spots. Every child in Chicago deserves an excellent education and I pray that this year we will collectively move closer to that goal! Good luck to all. I have 2 dogs in this fight. FYI- the letter will list Your Child’s Total Point Score on a 900 point scale (300 for previous year’s standardized test scores, 300 for previous year’s final grades, and 300 for exam score). While AC’s have published cutoff scores because each school typically has 90-120 spots offered, IG’s do not list cutoffs because they only have about 30 spots offered (same reason why SEES do not list cutoffs). Accepted students are invited to the school to hear more about the program prior to the confirmation letters being due. No mail for anyone yet?? I”ve scheduled my day around reading this blog…. My mail came at 10am and nothing. Not too stressed this time. He is at a great elementary school. Still would like my letter though!!! 12:37 was the first mail spotting on this blog when the highschool letters came. It was posted from someone in Lincoln Square, just an FYI. We got a letter for magnet school, but nothing yet for the academic centers. just got mine for 7th grade general I will only share 2 the rest waitlist numbers are crazy & I am hoping for AC letter which didn’t come today!!!!! Mail is in, nothing from CPS. We tested for gifted/classical but have not received anything. Same. No letter today for Academic Center. No AC letter today. Looks like Monday! I completely agree with CPS.Spectator. It is a crappy system. That said, best of luck to everyone! Seeking input: My 6th grader is at Agassiz Magnet. A good school on many levels but not great with the middle graders for a lot of reasons related to curriculum to classroom management to leadership to plummeting parental involvement (it goes thru 8th). She loves school and is frustrated with not being challenged. She is very high on the Disney II WL and waiting for a letter from the AC process. This might seem like an easy choice but im stuck. I want her to be challenged but is the Lane pr WY AC too much of a step up? Welcome your input. Thx. @ 34. I’m a parent of a current 7th grader at LTAC. Not knowing anything about Agassiz, thought I’d say a few things about curriculum at LTAC. Potentially all classes except PE are taught at a 9th grade level. It’s intense. But a good intense. If your kid didn’t get a strong level of previous education in Science or English, I could see some struggle in those classes. If your child is not strong in Algebra already, they can take Pre-Algebra, not hs level, which also helps. There is lots of tutoring offered if wanted. They do mid term and semester exams here. So that might be a new experience and something to talk/think about. It really feels like high school academically. Socially, my kid is very, very happy. Seems to be a real good group of equally motivated students. And the high schoolers are very respectful. If they stay at Whit or Lane, as Freshman they will be in classes with Juniors and Seniors for the most part. Just something to think about in addition to the academics. Not that you need anything else to think about. Good Luck. Letter came and we will be staying at our current school. Only applied to Taft and Lane. No offers. @36 – If it makes you feel any better two years ago that score would have earned your child an offer at Taft. I know that Taft and Lane had subsequent rounds last year but have no what the eventual cut off scores were. Anyone? west rogers park mom – thanks, we are really happy at our Elementary school so this was the least stressed I have been about these letters. Hoping my son is ok with it. I am wondering if 2nd round is a possibility….I have two at Lane so that obviously would have been the ideal situation. Good luck to everyone else!!! @34 – i agree with LTACer. My daughter loves the challenge and has made the change from neighborhood school to ac well. Our neighborhood has a laughable/nonexistent science program and she had no difficulty with high school level biology….the kids are of like minds: in class to learn. The teachers are prepared to teach them. They all still have fun and cut up, as 7th graders do, but they stay focused. There is a lot of support, too….counselors, tutoring, peer help, and great contact with the teachers. Thank you for your input. Our mail is not in yet, so don’t know if this will matter, but so far my kids had only vary basic science exposure, so this is the only subject I worry a little about if they switch to an AC. They are good at math, but never seen much of science. offered Whitney Young, it’s so far away. What tier are you? Was WY your first choice? @41, first congrats. If you’re saying “it’s so far away” was this not her first choice? Yes, that’s her first choice. I am thinking of going, so just complain of the traffic. She got 99% for ISAT on both subject, and straight As, don’t know why it’s 897, not 899. I heard if students in 8th grade apply for other high schools, they will lose the spot in Whitney Young, is this true, new policy? Not true 2 years ago when my son was an ackey. Has anyone seen the cutoff scores for 2014-2015 school year yet? @nervously waiting: i think we try to glean them as people post here, but i don’t think the scores are posted until a week or more after letters go out. @54 Congrats! Was Lane your first choice? Didn’t receive AC letter yet, but just realized that our Tier went from 1 to 3 in one year:( I spent the last 30 minutes looking at the map and it is crazy. It is really a block to block Tier system that seems to be purely income driven. All of the schools in our neighborhood are Tier 1 and our block is Tier 3. DARN that Census!!!! @54 5thgrade mom, your child is currently a 6th grader, correct? Offered a seat at first-choice Academic Center (Whitney Young) and first-choice Classical School (Skinner West). Two older siblings currently attending WY, so we’re very excited about either option for pure convenience reasons. Still waiting for our letter (so stressful), but my friend got hers. @60, mother of 5, what a super mom! Thanks for answering my question. Is there still open house for WY, we missed the last one. @Martin Wood: this is our second year in a row…then we get a 5-year break, and we do it again 2 years in a row. You must be weary! No offer. A bit disappointed as two older kids went to Lincoln for IG and it is amazing. @66 Same here. I thought i was doing something wrong, I couldnt find them either. So happy for my daughter! Only confusion is that according to this letter she BOMBED the classical test. Has been 98%+ every year but this year is showing Reading 78 and Math 64. Want to challenge but probably not worth it based on the above. If it’s true, guessing she’ll be at Lane for 6 years!! test score…..what is the top score you can and if it is not 300 (i’m seeing 149s), how do you get a 900 score? Actually got a call from OAE. South Loop was not listed on the acceptance letter so OAE is sending out a separate letter for South Loop admissions. South Loop? Did not they close their Regional gifted center few years ago? They are again taking new students? not sure we’ll accept, as we were seriously underwhelmed at the open house. My son just received his acceptance to LTAC. He had 864 and we are Tier 4. Accepted to 1st choice LaneTech AC, joining his brother. Lane Tech AC, my son is technically in 5th grade this year, but with this year’s test scores (private testing done in the fall), and a grade report specifying 6th grade, they allowed him to sit for the exam. I just wanted to get a feel for where he is at, compared to the pool. I am not sure we will enroll him yet, since he is homeschooled and we really enjoy the freedom to structure school the way we like it, travel when we want, go to the park when we want, etc. South Loop is phasing out the gifted center each year as the classes graduate. But they are accepting new application for those grades that are still located there, 3rd through 8th I believe. Offers from Pritzker and Lane AC! Whew! I can barely believe it! no offer. Any chances of getting into Lindblom ? Tier 4, 150 gifted score, 900 total, offered at Whitney AC (1st choice), also offer at Lincoln IG. Will accept at Whitney. Does anyone have experience with the Lincoln Elementary IG Program? Would love to hear about your experience with it. Would you consider choosing it over an excellent private school? But had it been 7th grade LTAC, looks like we would have been accepted, according to reports on this blog. We are happy with school we are at for now. Accepted into our first choice, Taft. WYAC and LTAC are too far away to put as first choice. Is 143 a decent gifted center score? Im not that familiar with that program. Is it at all possible to get in to WYAC on the waitlist with a tier 3 score of 702? I just received the welcome e-mail from Whitney Young! I have not seen the letter so I don’t know the score just yet. Did any one get e-mail from WY? WY…I’m not sure what to do…he’s going now to RGC-Beaubien. Does anyone have any info about Taft AC ? 98. If you would be happy with your son going to WY for H.S. as well as AC and your child has the maturity / work ethic to handle the AC, choose WY. If you are hoping for Northside, know that very few kids from WY are able to get into Northside with their 7th grade grades. WY has high school level coursework and it will be an adjustment and may mean that a single B that would automatically knock him out of the running for Northside, Payton, and Jones for H.S. Plus when you apply for H.S. it will be based on NWEA MAP for 300 of the points. How has he done on this test this year? Why did your son get an 866.9? Was it due to grades, ISATs, or SE Test? Things to consider as well. To get into Northside from Tier 4, your child will need almost a perfect score – 866.9 won’t get him into Northside for H.S. Must be very close to 900. Will turn down SW, accept Lane. Wondering if we can go back in the pool for Coonley RGC by declining SW. My dd is at Coonley Gifted, it would be ahhhhhmazing to have both at one school, even risking the HS spot. Decisions decisions. Should add that my son had a damn C last year. Why? Teacher have him a makeup test during lunch. Ds of course spilled sauce all over his test. Teacher threw it out and never readministered the test, rendering a zero and a grade of C at end of year as a result. So -50pts for the C.
hi guys – tier 4, score 873, accepted into LTAC, first choice. Anyone know if WY did a round 2 last year? Also RP MAma, do look into openings for Coonley 7th grade. It is great class of kids and all the teachers have been fantastic. But I’m sure a few kids will leave so there will be openings. WY did not do a second round last year. Yep, we have #2 on sibling wait list at Coonley and I intend to go talk to Mr. Z tomorrow and make it known that we want the spot. Unfortunately we can’t put our hat back in the ring for Coonley RGC without giving up Lane I guess, even if we turn down SWest? Weird that they offer two spots, one classical and one AC, but that we have to give up AC to go back in pool for RGC/Classical? So that’s nerve-wracking. If we had a for-sure Neighborhood spot at Coonley, I’d do just that in fact. It may seem nuts to consider giving up an AC spot, but my son is a very young 12, and I didn’t fare well at Morgan Park AC socially (I was the first 7th grade class, grew up in Beverly… Ended up going back to Sutherland for 8th). I was only 11, as the birth cutoffs back then were Dec 1st (November bday). 11 in a high school, not pretty. Lol. Ugh. I thought I posted but I do not see it. We are not accepting. We will only consider Whitney or Lane otherwise we are happy were we are at. In all honestly we tested just to test and practice. Good luck to those on the Pritzker wait list! I have to find my list to see what number Pritzker was on our list but I know it was not our number one choice. 843 tier 4 is no hope for WYAC, right? Tier 3, test score 138, total score 854.9. Got an offer at first choice–Whitney Young! My daughter is over the moon excited. I am thrilled, but also scared about the changes that are coming with the long commute and losing the bussing option for her little brother in the neighborhood program at school. Rogers Park Mama, please call and make sure that you have to give up both to leave option for Coonley RGC open. #98 & #103~the test for AC is a completely different test for HS. I wouldn’t worry abt not getting into NorthSide. Thanks to the parent who offered info for first timers–will be taking you up! Not hearing much from Lincoln IG? CPSO–Do you know when the cutoff scores for Academic Centers will be posted? For those with offers from Taft, my oldest daughter is in 8th grade at Taft, and she has been very happy there. She’s going to Northside for high school in the fall, as are quite a few of her Taft classmates. Whether your child needs a more challenging academic setting, or is just tired of their old elementary school, Taft has a lot to offer. @118 – I’ve inquired with OAE about when the cutoff scores will go up. High school went up a day after the letters arrived so hopefully tomorrow. Wow, those are some high scores, people. My son finally was clued into the AC discussion among the 5th grades, I guess because the 6th graders tested for it and are waiting for scores. It’s the first time he’s really become aware of this process, which is a little depressing. @NW side mom: my son is at a great magnet school with very dedicated teachers. He and his friends decided to apply for the AC’s to get more of a challenge. He was accepted to Taft AC. I’m so happy for him, but we live in Irving Park and that drive looks treacherous:) Can you tell me a little about the commute and highlights of what your daughter loves? I’d really appreciate it. @Cary, no. The cutoff last year for WY tier three was 834. My child got 833.4 and didn’t get WY; we did her Lane, however, tier 3, gifted score 149. Pretty sure 7 & 8th graders can get the bus to AC’s from their neighborhood elementary school. As long as you are within 2-6 miles from Taft, which Irving Park is, transportation should be ok. Of course, they have to wake up a bit earlier. Re: AC buses. The buses at lane had problems this year, too. i drive my daughter in the morning, but she said kids taking the bus were late on a regular basis, missing much of first period on many days. Have previous experience there so we’re fine with it. She’s right, busing was an issue this year but wasn’t in the past. We are also in the Old Irving neighborhood and had a series of new drivers throughout the winter. It’s better now. It’s really scary how you know everything that goes on CPSO.. lol. @AC’s Option, yes, I’m going to call OAE and make sure. I’d think with a 149 he’s got a solid chance at Coonley RGC. I’d hate to put him in regular on the chance he’d be understimulated after 7 years at Decatur on one hand; on the other hand, lets call a spade a spade. Cakewalking 7th in the neighborhood means a higher composite score with a kid who consistently tests in the 97-99th percentile, and higher chances for WY, Northside, Payton, Jones for 9th grade. Again I’d hate to give up a sure-thing with Lane, but thus far, not one of his friends got Lane. It’s a daunting place to go into blind for a late-bloomer. @CPSO, it really is awful. These Classicals were designed to feed into the AC’s and they used to basically get automatic in. Now there’s no guarantee you get ANY school for 7/8th, and essentially zero chance of ending up with even a single friend, much less your BFF. It’s not pretty, and 12-13 is hard enough an age. Lots of tears all around Decatur tonight I’m sure. Did not get into lane! @cpso re: translation into English. Ds had 99.8% math ISAT, 92 or 93% Reading iirc (they initially forgot to give us percentile scores, they came later and I can’t find that paper at moment). His grades were -50pts for a single C, otherwise straight As. And 149 for AC/gifted test. So aside from the singular C, his score would have been a 388.4 Tier 3 which would have rendered a WY spot, I’m sure, with his BFF. 😦 but not complaining over the Lane offer, or the Skinner W offer. BTW, Test prep totally worth it!!!! We are really (really!) on the fence re: accepting the offer…. this will be a very tough decision for us. Lane – first and only choice! Have heard nothing other than raves about the LTAC. Have an older sibling there and it will be nice to have them both in the same school. DS got offered Kenwood! Yeah! I will post on magnet thread that he got a magnet seat at Franklin Fine Arts that we won’t be accepting! So number 1 on wait list for 7th grade you will be getting a call! He was also 3 on wait list for Sheridan! To all who got Kenwood AC….you got a real gem. Enjoy. I cannot say enough good things about the program. Did Lane do 2nd round last year? RogersPark Mama – Please tell your fellow Decatur 6th grade parents not to be distraught over AC decisions. Same thing happened when we were at Decatur. Some did not get any AC offer or not their first or second choice offer and some went to neighborhood schools. It all ended well. Our Class of 2012 will be entering H.S. in the Fall. See Mrs. Kukielka if you would like to see the list of where everyone ended up. I shared the list with her as well as the school counselor and 6th grade home room teacher to help kids and families see that it is not the end of the world. Our kids did well: some going to private H.S. on full to almost full scholarships, a couple going with IB, the rest SEHS Jones, WY, Lane, Northside, and 1 Westinghouse. Some turned down Northside or Payton to stay at their AC H.S. Also, it is a huge myth that in the old days the kids went from Decatur to WY. That wasn’t the case 9 years ago and is not the case now. I think that is more like an urban myth within Decatur. CPS used to cater to Decatur kids more, that is true, but it seemed consistently 6-12 kids went to WY (depending on how many 6th grade classes that year) over the years. I had heard that Decatur had been trying to better prepare kids and share that the AC decision is not the end of the world to help minimize the trauma. Based on your post, looks like much more work still needs to be done. Best wishes to you and the Decatur Class of 2014! @ jb per a friend’s recommendation, we did selectiveprep.com. It really prepared him for the test. Totally worth it. 873 composite (in this case) translates to all As, 99 and 99 isats, and test score of 141 (out of 150). No test prep. Hope that helps. @109 so obvious your MP. Hilarious and still bragging. Yes, please give up the AC spot. Thank You. @Decatur 2012, thanks so much for your post! I think the parents are all taking it (mostly) in stride. It’s the tender hears of the kids that seem to be having a rough night. I expect not much will be done in the way of learning tomorrow, LOL! It sounds good to hear that the 2012 kids all got good spots. I will ask J and Ms.K for the list. One of them will likely give it up, lol! Oh and the urban Decatur myth… Verrrrry verrrrry interesting. Though I will say, I’m an AC kid, and was one of the first Options for Knowledge kids preceding entry into the first AC class at MPHS; which means I’m pretty old. Lol. Anyway, back then, Options kids did get AC spots without much effort. Or maybe that was just dirty southside politics. Haha. Perhaps if you could spellings impart that to your child, Jax, you wouldn’t have to covet our AC spot. Hmmmm? Pretty sure everyone here is sharing results. My choice for my child and what’s best for him socially isn’t bragging. It’s called parental concern. This from someone who’s left 3 SEES schools in shame in 6 years. HA! At least I caught my iPhone mistake. RogersPark Mama, before you turn down Lane, you should at least go the the Meet & Greet for accepted LTAC students. Fyi, my daughter also is a Decatur grad, currently an LTAC 8th grader, so we feel your pain in regards to the stress. Socially, Lane is a pretty welcoming place and if you do decide to accept Lane, I think your son will make lots of new friends. I know my daughter did (and all of her Decatur friends went to other schools, too.) Let’s not forget, this is an entry level grade so they are all new and looking to make friends. So much easier than coming into a 7th grade classroom at another school as the “new kid”. @RogersParkMama, I don’t even have a kid in your class, but I knew it was you the moment I read your comments. I’m sure Coonley would love to give you the spot. I’d hope you’re not as insulting to all the other parents as you are to eM5, but I already know the answer…..
Lane really is very welcoming. We were concerned about the size of the school going in. The LTAC teachers and staff make it very welcoming…make it feel very small, actually. Great support from teachers, counselors, tutors. One-on-one days in small groups with mentors scheduled last year at the end of the school year (after school lets out). An overnight camp outing of just LTAC students and teachers for getting to know each other, doing teambuilding things, toward the end of summer before school starts. The kids are make friends quickly, really. And, at least for my 7th grader, all the kids pretty much get along with all the kids — there’s no “jock” “brain” “etc” grouping there. Does anybody know if the Taft AC kids mix with the high school students….or if the students are welcoming to African American kids? Hi, My kids are a year or two below AC age, but I have a question about qualifying: the school they go to (private) does not give letter grades (at least through grade 4, and I don’t think for 5 and 6 either) Will this cause a problem for entering an AC? Do people know of those who have moved from private to AC? @147 Oriole Park Mom, Lane did have a 2nd round. I believe calls went out mid summer. Not sure how many spots. Also received a welcome email from the Vice Principal and registration info for Shadow Days. Does anyone have any other interesting information on WYAC that might have attended the open house? Someone above posted that Lane AC kids will take physics, trig, etc. with Juniors when they are Freshman in HS. As an FYI, the Lane administration indicated that they are (or maybe already have) building classes for the AC kids to remain with peers. So they will be in physics, with other AC kids or other freshman who already completed biology and chemistry in 7th/8th. Hope that makes sense. One nice thing about AC is that the kids build HS credits and can have 13(?) by the time they are a freshman. This means taking AP starting freshman year and senior year of HS open for electives or AP or whatever since your requirements are essentially done. The potential downside is that grades for classes that get HS credit go on your college transcript starting in 7th grade. Something to consider. Socially, Lane is very cool and it seems the kids make friends easily. The overnight at Camp Duncan was a great way for kids to quickly make a lot of friends. Holy smoke – scores to get into Lane went up another 15 points over last year..
ask at your school what they did before in this situation. Our school does not have grades K-5, but does have them for 6-8. So what they do is apply the same grading scale as they use for 6th graders to those that need their 5th grade letter grades. Tier 4, 136 test score, overall points 692.8 (ahem….too many B’s). I figured it was a long shot for my son but glad he took the test anyway. He was accepted to 7th grade Disney II which honestly will be better for him. Congrats to all who got into the AC program. my dd has a score of 714 and was not accepted to any schools. The cutoff score for Lindblom (3rd choice on application) is 640, what are the chances of getting in? Forgot to mention, this is for 8th grade. For WYAC, Dose anyone know how many kids from rank (scored 879-900), how many kids from tiers (scored 808-879)? That will tell if WYAC is really that good to go or just CPS school. LTAC parents — It appears that (unlike WYAC), there are no shadow days for students accepted to the Lane AC… Is this true? Does anyone know why? Do you think the Lane administration would consider a shadow day if a student requested it? Bussing: The busses have definitely been an issue. There were a lot of late busses and even a couple of no-shows due to snow and cold. However, if kids show up late to a class or even miss a class because of the bus situation, those are excused tardies/absences. And my daughter’s grades have not been negatively impacted by the bus issues. Mixing with high school students: The high school students pretty much ignore the AC students. My daughter participates in a club with high school students, and she hasn’t had any issues with those students, probably because they are kids who share her interests. I think what I found most beneficial about Taft AC is that it has helped my daughter figure out how to take responsibility for her own education and schedule. She attended the RGC in our neighborhood so we really didn’t need her to move to an AC in order to be academically challenged or better prepared academically for high school, but I think moving to a bigger school with expectations more in line with a high school helped her learn how to prioritize and organize her work and her schedule, without mom hovering over her. Can anyone share their experiences with the Lincoln IG program? Thanks! Can anyone share their experiences with the WYAC program? Thanks! curious as to what your score and tier were? Trying to gage if we JUST missed it or were way far off, thanks! We have loved the Lincoln IG program. My 8th grader went there for only 6th grade and then to Lane. My 7th grader is there now and loves it. I feel the classes are challenging and interesting for my daughter who coasted at elementary school and didn’t really want to work hard before going there. She works hard and has been forced to step out of her comfort zone with public speaking and presenting. The teachers are great and Lincoln runs well. She is learning French and has the chance to do the exchange program in Paris next year. They both learned how to do Cornell notes and Socratic seminars. My 8th grader was grateful for those skills at Lane and was able to take more advanced Band because of her experience at Lincoln. Happy to answer questions. @160, My friend had two kids in a Catholic school who went to WYAC starting in 7th grade. She never said anything about there being any issues with not transferring from within CPS. Although I’m pretty sure her kids got letter grades at the Catholic school. I’m sure CPS has addressed this before, though. Good luck! 890 (ish) – I am at work (letter is at home) and I don’t recall exactly… could have been something like 888.something or 889.something…. Sorry I can’t tell you exactly! Did not get into first choice WYAC, offered seat at Lindblom. Looks like some test prep classes before we try again for SEHS! @180 IG: go to the Open House. I have had friends who have sworn it is the best middle school experience in the city (If your child is motivated). @180 Go to the open house! Good luck! There will be construction going on next year as they expand the school, and I am not sure how they plan on handling the overcrowding issue since the University did not look like an option for next year. What I can say is that I trust the Principal to make it all work with the least impact on my child. mmdemom and curious – thanks for your responses! @172AE: No, there are no shadow days. Administration will not give a shadow day, even if requested – we did request last year and our request was denied. As an incoming parent I didn’t feel very good about it, but now that we’re 3/4 of the way through the year, I can see that we didn’t need it. @NWSide Mom: Very well put about the student taking responsibility for self and schedule! That has been our experience this year, too, with our daughter at LTAC. That’s great~that’s how it should be. I hope she has a lovely time at Taft! I’m not sure I understand the question. The class size is usually about 120. The rank scores get 30% of the seats, and the four tiers each get 17.5% of the remaining seats. My daughter is in 7th at WYAC now. She came from a neighborhood school. She loves it. It took about two to three months to learn how to juggle the work so that it did not get overwhelming. We had heard that would be the case, and she did figure it out. There will be a Academic Center Family Night in May. You’ll get to meet other parents and students. Last year, they split us up into groups by region and allowed us to ask questions from a current parent and rising 8th graders. It was very helpful. There should be a two-week orientation in the late summer (half-days). It can sound daunting if have to juggle work hours and don’t yet know anyone to carpool with (that was our situation), but the orientation was invaluable in allowing my daughter to get to know some teachers and students and gain confidence on the campus. Last year, the ackie paperwork highly recommended taking the “instructional support” elective for 7th grade. My daughter did not want to (she wanted to start a language), but we insisted because the school itself was pointing out that this class (“study hall,” really) was important during this “transition year.” It’s a six-year plan, so she’ll have plenty of time for her language and other classes. It has turned out to be a wonderful thing–not only does she have one fewer class-worth of homework, but she also has this period to study, finish/start homework, work on projects, etc. I suggest considering it. Did NOT get accepted to Lincoln IG. @188 To clarify, the WYAC orientation is for students-only. I only mentioned juggling work hours and carpooling simply because the half-days can wreak havoc on the “chauffeur’s” schedule. The first day and final day of orientation did have parent activities. My daughter really has her heart set on starting off w/ a language elective, thank you for letting me know about the “instructional support” elective for 7th grade. Coming from a Language Academy she’s been itching to getting into Japanese, but from the sound of it I think the instructional support would be more beneficial. Do you recall if the 2 week orientation was around the August month? Does the AC program follow the same bell schedule as the H.S. program of 8AM to 315PM? Do you know if they offer any transportation options as well…I apologize for all the questions, many of which I plan on asking during the mini parent assembly during shadow days, but I greatly appreciate all the information you have shared! Declining as had OneandOnly take the test for practice as did some of the other students in the RGC 5th grade class. Gunning for the LTAC next year! Got accepted to Lincoln IG. But will definitely try WYAC next year, so not sure whether should accept the offer to Lincoln. Anyone has suggestions? @193, well if you don’t take the spot, 189 will get a call!! Wow. close cutoff. Thank you all for posting your info. My daughter really has her heart set on starting off w/ a language elective, thank you for letting me know about the “instructional support” elective for 7th grade. Coming from a Language Academy she’s been itching to getting into Japanese, but from the sound of it I think the instructional support would be more beneficial. She could do both–she’ll get to pick two electives. (My daughter already had auditioned for band, so she chose band and instructional support instead of her original preference of band and language.) She’s happy about it now, though. She enjoyed the breather during the day. Do you recall if the 2 week orientation was around the August month? Does the AC program follow the same bell schedule as the H.S. program of 8AM to 315PM? There is CPS bus service for 7th and 8th graders. It didn’t work out for us because our designated pickup/dropoff point was inconvenient. You’ll find that a fair number of the kids at Lincoln have parents that also consider privates, so this is a common topic around the school. Lycée, Latin, Parker are common transfers (to more than from) but that’s for the school as a whole. IG is different, attracting kids from the entire city, not just the LP bubble. Less talk of privates as options, more parents focusing on Payton admissions. If your child scored into IG they would be the top student at Parker for example, but would be surrounded by peers in IG. On the other hand Lincoln is still CPS so you have to be ready for some crazy teachers union and bureaucratic absurdity. @JenFG Thank you so much for all the insightful information! i would love to know the cut off score for Ogden IG entering 6th grade. Thank you JenFG @ 188. I am not sure if my daughter should register for ‘instructional support’. She’s very self-motivated and independent. If ‘instructional support’ is more beneficial, that means she will have to drop one of her current selective courses that she really want to enroll. Is the honor language courses related to AP? I am really confused about programing day. Anyway, Thanks for any info. Yep, you should definitely take your child’s personality/study strengths into consideration when it comes to Instructional Support. (It is called Instructional Support, but note that it is really a study hall. There is no one actively “supporting” you unless you specifically request a meeting with a teacher during that period.) Honestly, the WYAC paperwork that stressed the importance of Instructional Support frightened us into having her take it! She had attended a neighborhood school, and we weren’t sure if the curriculum at the AC would make an overwhelming leap forward. So, the elective seemed like a good option, and she does find great value in it. With that said, she doesn’t want to take it again next year; she has a handle of her schedule/workload. By AP, do you mean Advanced Placement? Not sure what you are asking. If the student has taken a language class in the last, they can take a test on programming day, if I recall. Same thing for auditioning for performing arts. They will be told if they can skip the beginner’s level class. Programming day involves standing in several lines, turning in a stack of paperwork, taking any of the above-mentioned tests, and turning in your list of requested classes. I believe it is also the day the kids take a math test. Based on the results, they will get assigned Algebra Part 1, Honors Algebra, or even, I believe, Geometry. But you don’t find out what you were assigned until orientation. Congrats to those who received offers. We did not get accepted to any of the ACs we applied for. Score was simply not high enough for tier 4. We did selective prep but it did not help us much. 7 classes for an ackie is ALOT. Ackies have a heavy workload. I think the school is trying to impress that upon you. I would skip an elective for the upcoming year. WY has an excellent AC program. Not only would your child’s gpa probably suffer, but it might be too exhausting for her~w/the commute, homework, and you do want her to have a social life. Once your child gets involved in WY, these kids don’t want to come home (especially when they get to 9th grade and beyond), if that school was opened all night, they would want to stay. @decatur2012— it’s not a myth that Decatur kids went to WY. They mostly did, but that was25 years ago. Wow! Not her! Why are you so jealous of her? Why would you call someone out by name? So strange! From her FB post she does not need your spot she has a WY offer and a RGC offer. I am sure her child does not get into all of the top schools on luck alone. Before judging others check your own sentence structure and spelling. Truth be told I was hoping you would decline so I don’t have to deal with you for the next 6 years at Lane. PS. I am secure enough with myself that I am okay with typos. We are all human and auto fill happens. Thanks for the words of encouragement for kenwood! My son & I are very excited! He looked over all the lists of classes & activities & was talking all the stuff he wanted to do & take! I will have to slow him down because I don’t think he realizes how the workload will be! Yes I agree kenwood is a hidden gem! I was really impressed at the open house! OT but I couldn’t find a section for misc postings-sorry but it is a great letter. Has CPS ever shared the results of the AC tests? It is so frustrating getting a score back with no explanation of where and what was incorrect. I want to know what my daughter did not do so well at so I can address this with her teachers. Are parents allowed to call and get an answer from OAE? Can anyone tell me how “2nd round” works? Is it the same tiered system in that a tier 1 decline would be replaced with a tier 1? How do the Rank declines work? Thank you. 211 I totally agree with you. Maybe we should get together and see how we can help our kids . Maybe we should start a group for that. What do you think? My daughter is going to WY. Her score is 146 and 885. But some people said if you go to WY, the opportunity to go Northside high school will be decreased. Could anyone explain this? Especially want to ask @103. Test .Thanks! @211. They do not share results and for the most part it is my understand that these are IQ tests, not what you know already tests. @214, the curriculum at any AC is pretty intense thus increasing the chance for a less than “A” grade. And as of this year still, WY has a higher cutoff percentage for grades than most other CPS schools. As in 93 and above for an A, 85 for B. Have you ever known of anyone challenging their child’s test scores? 216….we tried a few years ago with the ITT staff and it was like Fort Knox – they would give away nothing and were too worried about us finding out the test questions than getting the scores corrected…I guess it would take a law suit to get them to open the tests. CPS was not helpful in our quest to challenge the score. Thanks 210 – but I have a simple question…how can posting a Min and Max and Mean score for each IG program breach any privacy? If there are 30 slots, then take the mean, min and max of those 30 and provide a number. Then those who are in can see where they stand and those who did not get in can see what was needed. Thanks JenFG and SoxSideIrish4. Very helpful information. Still done by Tiers. So, for some schools in some years, likely that the Mean for all would be below the Min for one Tier, and then they have to answer a bunch of (likely irate) questions from the marginally informed parents. Not worth it, so assert ‘privacy’–and with 5 or 6 kids per tier as tier admits, that’s a non-absurd explanation. @PilsenMom My child is a current 7th grader at WY we also live in Pilsen. Transportation was an issue at first because of the limited bus stops,if he did do CPS bussing, the closest stop would be on 24th and California. We started doing drop off and pick up but with the crazy weather,we decided to let him start using CTA. He met another boy that lives nearby and they started commuting together. Last year, I would’ve told you that I thought he was too young to be on public transportation but he’s grown and matured so much since he started at WY. Your child can get into Northside from WY, but it is much tougher to do this from WY (or even Lane). The ACs at WY and Lane are challenging. Some kids can / do get straight As, but it is much harder to do so. Many Taft AC kids are able to get straight As and get into Northside. Think about it – your child is moving from 6th grade elementary to 7th grade in a H.S. with H.S. classes. There is an adjustment period. In that adjustment period, may miss getting all As. If coming from a school where your child wasn’t challenged or didn’t get lots of homework, there will be an adjustment that will vary based on your child’s preparedness for the AC. WY curriculum and grading higher than most other schools and at least at WY, a 93 is an A (and not a 90 like many other schools). Even your child’s elementary school may have 90 as an A, so more homework, more actually challenging work, and higher grading scale may result in a B or less which for Tier 4 automatically knocks you out of Northside. If Tier 1, may still be in consideration, see cutoff scores for H.S. for this year to give you an idea of type of score you need to get into Northside if that is your goal. WY is a great school and no need to leave for H.S. But if your dream is Northside, definitely going to be more challenging gradewise to do so. Still possible thought, just tougher. Thank you for the info! Its to find another Pilsen family on here. Would you mind if I emailed directly in regards to your experience so far and this whole transportation issue? We’re tier 3….oldest kid got into Lindblom AC last year and now youngest kid just got her Lindblom acceptance letter for next year AC. First choice was for WY but neither one scored high enough but we’re still happy. Get this though….my younger daughter and her classmate both attend Poe…..both got the EXACT same score…831/900….her classmate is tier 1…she got into WY and my daughter didn’t. …..all because of these so called “tiers”……is that fair or what? @215 I had read that the academic center tests are more IQ based. My oldest daughter scored the same score 2 years apart. She is a graduate of the LTAC at Lane and currently enrolled at Lane. My 2nd daughter just tested and I feel she should have done better on the test. Many of her classmates also did not score as well as us parents thought they would have. I would like to see where she/they didn’t measure up, so it say. But since the city we live in does not believe in transparency we have to trust the scores they give us and I think that’s crappy. I would tell all parents to double check the calculations CPS sent in the mail. Year 1 that we tested CPS miscalculated my 1st daughter’s score for AC. I fought it and they fixed it. It wasn’t easy but they fixed their error. I don’t trust CPS and I believe we as parents are entitled to see this test and the results that seem to make or break our kids futures. I truly believe all kids end up in the school that is right for them but the process is shady. Oh, and I have 2 more younger kids that need to survive through this process. Sorry for the long rant! Since CPS uses MAP instead of ISAT testing for high school application starting next year, chances are if a kid in AC got one B three As on his/her 7th grade with very high MAP, he/she can still go to Northside or Payton, right? Could some please tell me how much score a kid will get with 1 B and 3 As for his/her 300 grading part? 226 – what tier? I wouldn’t count on it for tier 4. The general rule is if you go to the AC plan on 6 years. No Bs in Tier 4 to get into Payton or Northside. I don’t think any student has a chance of entering WY, WP, NCP or Jones if they received a B in 7th grade and in tier 4. Thanks for the Test, and @LTAcer! That makes sense. Thanks for the detailed explain. We still plan to go WY, but for Northside it is our dream. Now we need have a reality attitude. Thanks again! Just don’t be blinded by the prestige of having a kid at Northside. It is easy to get caught up in that. The top SEES H.S are all excellent. WY is an awesome school. Your child likely will NOT want to leave. School offers so much. Best wishes! Can anyone tell me how “2nd round” works? Thank you. I really agree with the parents on here who have been emphasizing that there is a significant transition between elementary school and an AC. I also agree that the AC model was designed to give kids a 6 year high school experience. I think it’s really harsh to put kids through the crazy stress of making straight A’s, earning fantastically high ISAT scores and earning really high IQ test scores (which is really the AC admissions test) in 5th grade and turning around and putting him/her through it again in 7th grade. The stakes are already very high for them. They each learn from the first day that the grades that they earn in *7th* grade will be on their transcripts forever. The added pressure of making sure that those grades are perfect so that they can reach the next brass ring in two years seems really, really harsh and the makings of a long and expensive relationship with a therapist during his/her adult years. That said, I’m not saying that if a kid decides that he/she is interested in going to another SEHS after finishing up an AC they shouldn’t make the move. I’m just saying that it should be an internal pressure and decision coming from him/her based upon their experiences, goals and specific knowledge about the school. I don’t think that it should be based on reputation or a *parent’s* desire for the kid to be at a different place when he/she is in 6th grade. @Pantherettie…u r so right. Unfortunately for us, my son only got accepted to Taft….so we’re gonna have to go through this all over again, however, you’re point it’s valid….it is very stressful….we’re gearing up right now for the trip. Please tell me, is it just AC grades that will show on high school transcripts or is that the rule for all seventh graders? All grades show up on HS transcripts, but only the HS classes are calculated into their gpa, I believe. Also, since your child is at Taft for AC, would you consider staying there? Taftmom – only high school credits earned at ACs are on the transcript. If a kid takes algebra in 7th or 8th grade at a SEES or a RGC and they pass the end of the year test, they get credit but a grade doesn’t appear and is not part of their high school GPA. At an AC the algebra grade will appear and will figure into their overall GPA . That’s why I say the stakes are so high. When you have a kid who is taking at least 5 (English, Algebra, Science, World Geography, Foreign Language) classes at the the *honors* high school level at 12 or 13 it’s kinda a big deal. I think that we sometimes lose sight of that when we discuss the admissions portion of the process in so much detail. #237~are you sure that ONLY hs credits on the AC transcript? I have my child’s from last year and all classes are listed with grades, but only the HS are calculated for gpa. @Soxsider…I don’t plan on staying…but I didn’t plan on him going there either. I keep hearing the IB program in HS is good, and rumors say that AC kids get an automatic seat in it…. I don’t know how true that is. The IB at Taft would b a last resort. Does anybody have information about WY AC student bus pickup/dropoff point around Lincoln Park? There is a huge difference between WY and Lane AC and Taft AC. Plenty of Taft AC kids are able to get straight As and transfer to another H.S. Taft is not as rigorous as WY and Lane. WY / Lane kids have a higher bar to get As. Plus once in WY or Lane, no reason to leave. Both have excellent H.S. programs with lots to offer. Families who come from neighborhood schools tend to love the challenge Taft AC provides their kids compared to their neighborhood school. Families from SEES? Not so much. Most SEES families are under-inpressed, having come from accelerated curricullums of SEES. @Test: Where are you getting your information from? I’ve heard that families love Taft AC and often the kids do too. When you say “Most SEES families are under-impressed”, was there a survey? My child went from a magnet school to Taft. She has found the high school credits helpful in high school because it opens up the door to more electives (and earlier AP classes) for her. Plus, since she did relatively well in those classes it was nice to start high school with a respectable GPA. Bear in mind, however, that not all schools take these credits. LPIB kids have to re-take Biology. Some SEHS require a math pre-test despite the result of the Algebra placement test and high school credit. I am not clear how these situations are reflected on a high school transcript or how they affect GPA. All Taft 8th graders also take a class that gives them their COMPLETE CPS required service hours. This isn’t a huge requirement and not hard to meet but its nice to know its there, especially since some schools and programs require more than the maximum service hours. Taftmommyscared- Don’t worry. Your son will love Taft. It has a nice mix of Decatur kids, neighborhood kids, RGC kids, and private school kids. Just tell him to hand in his homework when its due and follow directions exactly with the 7th grade computer teacher. For RGC parents who were accepted to Taft, I guess it depends on how important the high school credits, and your child having a true middle school experience are to you. Another thing to keep in mind– kids can have bad days and bomb tests- its nice to have a viable back up for high school. It reduces the level of angst a bit. And many, many kids from the TAFT AC chose to stay at Taft for either IB or AVID. I found your post very helpful. Maybe we should turn down the offer from WY. I don’t want to do therapist in adulthood for my kid. Sorry to hear that story. Is your child doing good now? This is a helpful post. Can I ask what High School your child goes to now? I’ve told my son that he should be happy that Taft has a great IB High School, but to keep his grades up so he has other options…just in case. I read a lot that about half of the Taft AC kids stay and half leave…was that your case? Can anyone share their experience with Ogden IG? You have to look at your own child. We are just giving you some things to think about. Every child is different and need to consider whether your child is ready. The Principal tells accepted families the same thing – we are not saying anything different. Is your child ready? WY is a great school – it would be hard to turn down an offer, especially since there are no guarantees for the future. In the end, if you are o.k. with your child staying at WY, strongly consider taking the offer (really, why would you leave – WY overall has more offerings albeit different ones in some cases than Northside). Otherwise in 8th grade you will have the stress of doing this all over again with no safety net. Don’t think for a minute that when your child is an 8th grader they won’t feel this stress – actually will feel it more. CPS is constantly changing the rules. I’d seriously consider taking the offer, especially if you are in Tier 4. My daughter goes to WY…she was not in the AC, but she absolutely loves the school. She is in track, chorus, fashion design and takes AP classes. She feels very balanced and happy with the high school choice she made. From directly speaking with the kids and in some cases the parents from several SEES. It is a very small SEES world and we tend to know each other, even across different SEES schools – especially on the North side. Again, if coming from a neighborhood school, Taft AC well loved. If not, not so much. Good option to have for the reasons mentioned above by other posters. I’m really glad to see how this string has evolved into a deeper conversation about the realities of attending and AC in addition to the results of getting into one. @Taftmom – I totally get where your’e coming from. It seems that your son has some internal motivations towards going to another school for high school. To me that’s the guiding principle in making decisions about what he should do and where he should go. It may turn out that he absolutely loves Taft and wouldn’t dream of leaving or it may turn out that he’ll get what he needs from the school from 7th and 8th grade and move on to a different high school experience. It’s just important that it’s his choice guiding the decision (with strong support and resources from his parents !!) I’m sure that you know you’re child the best and will know how much and how hard to push him in what ever direction he decides. @ Soxside – I thought that Taftmom was asking if all 7th grade students who take high school level classes get credit for them on their transcripts or only Ackies. My understanding is that only Ackies do but if you know differently then definately share your info. @CPSJoke – I don’t think that it’s absolute that a kid will end up in therapy, I’m just suggesting that too much pressure for too long on kids because of our wacky CPS AC/SEHS testing stuff may lead to problems. I think that smart kids do well in rigorous academic environments when there is balance and support.Focusing on testing and grade perfection for multiple years is not balance (at least in my opinion). That said, my daughter goes to Lindblom and really loves the school. She’s doing very well there academically and socially. I would be surprised if she wanted to go another school for high school. If she did want to go to another high school, I would support her decision but I would not put any extra pressure on her regarding grades and test scores (e.g no Selective Test Prep!) because a strongly self motivated has enough pressure on their own. I totally agree what you said ” it should be an internal pressure and decision coming from him/her based upon their experiences, goals and specific knowledge about the school”. But the problem is the kid has no experience and zero knowledge about the school. It’s such a big decision for a 11 years old. Somehow, I feel that I should make things easy for her by making decision for her. Take the easy way, stay in current school and go to Northside for high school. I wish I never got her tested. She’s already excited for those interesting courses in WYAC, and became even more disappointing for her current school. The best way is, like what my parents did to me, make decision for kids and make kids feel like they made the decision. I made a big mistake. It’s so funny that you all mentioned Northside Prep…That’s always been his first choice for high school. Being at Taft might be exactly what he needs to go for NP. I read somewhere that it is a feeder school to Northside prep. I think they said, last year, 21 students from Taft got accepted to Northside Prep. Thank you @ test. We live in the far north of the city. It’s not WY high school is not good enough, it’s just not realistic without a school bus. My daughter is self-motivated and sensitive enough, if she knows 7th grade score will be in her high school GPA, OMG, that’s too harsh. I don’t want to push her at all. Good to know the 7th grade GPA thing, I never knew that before. Commute for H.S. – yes that is true. We are lucky to live by the Blue Line. Lots of kids taking train to WY, Jones, and Lane from far Northwest side for H.S. now. Blue Line leaves you steps from school – easier to get to WY than Lane which is closer (for Lane have to take Blue Line to Addison and wait for an Addison bus that is not crammed full of H.S. students – usually have to wait for 2nd or 3rd bus since so full in the a.m.). Great! About a third of those 21 going from Taft to Northside last year had attended Decatur. So kind of a Decatur to Taft AC to Northside feeder thing also going on! What is the second round exactly and how do you get in the second round? Wow !!!! Thanks for your input. That’s good to know especially coming from a current student. How many people attend Taft 7th grade academic center? Would a 8, 9, or 10 on the waiting list stand a chance of being accepted? Just wondering- has anyone have an experience of going from SEES to LTAC? Has is been much harder? My daughter is in a top SEES right now, just got accepted to Lane. We are very happy with her current school, but seems that she got her mind set on Lane although the ultimate plan is Northside College Prep. I am not going to give you any advice, but my son always wanted to go to Northside CP. He got into Lane Tech AC (first choice) from a magnet school with a gifted program. This year he took the SEHS test (just for fun) and got perfect 900 overall score (all A’s and 99% ISATs). He declined the spot at Northside due to his academic experiences at Lane and open house visit at NSCP. So you never know what future holds for your child. I will be at LTAC next Tuesday with my wife and our son for meet and greet, so if you are there you can talk to us. My son did the exact same thing as your son, Peter. He attends LTAC and got a perfect 900 score, so he got an offer at Payton. We went to the open house for Payton and it was indeed impressive. But he is getting a great education at Lane, there is a huge selection of classes and electives, and most importantly he has grown up socially there, has good friends and is having fun, a factor that should never be minimized when picking high school. So he’s staying at Lane. Add my daughter to the list from LTAC who tested and was accepted to Northside with an almost perfect. She came from Lincoln IG. She went to the open house at NSCP and liked it, but loves Lane. She is thriving and is able to pursue her music major in addition to academics. She has made good friends both her age and older. The overall experience has been great. Good luck. Thanks for the Taft comments. My daughter was accepted at Taft. She’s currently at a high-performing neighborhood school, doing extremely well academically, socially and has plenty of extracurriculars We took the test mainly as practice just to go through the CPS drill – but as she’s looking at the class offerings at Taft she’s excited about the electives – drama or creative writing, and taking French. I am inclined to stay at the neighborhood school, thinking she’ll have more options when high school rolls around if she stays at the neighborhood school. My child scored a 147 and is a tier 4 for K. No offers. Didn’t take any reading or math test. What schools did you list? I am enjoying this discussion….just caught up after a few days. I have to agree that the motivation cannot come from anywhere but the child. My 7th grade LTACer asked *us* in 6th grade if she could test. We thought there would be an adjustment period for her at an AC, especially coming from a neighborhood school without much if any science, and we expected bumps. Some of her time management skills needed strengthening at the start, but she has done extremely well there because it isn’t us….it’s her and her goals. She has eyes for nowhere but lane, is doing the 6-year plan. Our current 6th grader asked in 5th grade if she could test for AC, once she saw what was available to her via her sister. She did test this year and has been accepted to Taft. Disappointed at first because it wasn’t lane, but recognizes that it’s her opportunity to excel and do something different on her own. She has already mapped out how she will fill in her missing orchestra (Taft doesn’t have one, our neighborhood school does) on the side in addition to looking forward to entering a sehs in 2 years if she decides that is what she wants. She commented, though, that if she thinks Taft will help her achieve her goals, she’ll stay. And the people who have commented about the tier system….i agree. tier 3 is just across the street from me. There’s no difference between me and my neighbors. Daughter took selective prep class which seemed to help her and instill confidence. Mostly, glad to be in tier 1 (kind of offsets the graffiti and violence in our neighborhood). It’s an imperfect system, though, and I feel for the tier 4 folks. I’m currently an LTAC 8th grader. I came from a SEES as well, and yes, there definitely was an adjustment that first month or so, although it does let up eventually. There is a lot more homework than before, and let me assure you, it’s not busy work. The program is fairly demanding, but I still got straight A’s, so it is possible. You do have to be pretty focused and organized to succeed, however. Personally, I’ve had a fantastic experience in LTAC and I wouldn’t want to go anywhere else but Lane for high school. I went to a very small elementary, but I love the big environment of Lane. Northside seems almost cute to me now, it’s so tiny in comparison. When I was little, I did really want to go to Northside, but ever since the LTAC program came into being, I’ve been sold. There are just so many more options for classes here than you can get anywhere else, and you get a really great head start with LTAC. I’m taking all sophomore and junior classes next year including 2 AP. I’ll be at the meet and greet as well, so I can answer any questions you might have then. @merelyastudent, this “Northside seems almost cute to me now” made me smile from ear to ear. Thanks for that. Thank you so much for putting me more at ease. I know that she’ll be fine whatever she decides to do. I’m very proud of my daughter! Dose anyone know if Whitney Young AC has orchestra for higher level than beginner? My kid is advanced level player and is about to join Chicago junior symphony orchestra. But with the workload in AC, I guess school orchestra is enough. It’s kind of sacrifice. Really hard decision. But would like to know what kind of orchestra WY has. Thanks in advance. Hey guys! I know you have a lot of current/former LTACers on here already, but if you have any questions I could always try to answer them. I’ve been at the program from the beginning (and have had straight As since I began), and I scored at 900 on the high school entrance exam. Lane is AWESOME and as both a former LTACer and an ACES mentor (mentor for LTACers) I’m really excited about who we’ll be seeing next year. It is a big transition, though, so feel free to shoot me a question. I’m going into my sophomore year, so I can also talk about what the transition to high school is like for LTAC and what kinds of opportunities are available at Lane after 8th grade graduation. @279, According to the WY Course Registration Guide, which you can access from the school website, WY has beginning, intermediate, and advanced orchestra. For intermediate orchestra it reads, “Incoming freshmen and 7th graders with previous experience are encouraged to audition.” Enjoy. I believe incoming WYAC students can go through an audition for placement into one of the higher level orchestras. I seem to remember a former classmate of my daughter’s doing this. You should contact the school to find out details and how to schedule the audition. I recently spoke with a current WYAC parent whose son tried out and made either the intermediate or advanced orchestra, and she reported that it was a wonderful experience. Math – 76th percentile (raw 234). She is a high 90’s ISAT kid. If you are on the fence and wouldn’t mind checking to see if your kids fall MAPs align with ISAT scores and wouldn’t mind posting, That would be great. Wondering if this is happening to other bright kids! Thks! According to my student, kids haven’t been taking the MAP that seriously. That will change now, I imagine. Comparing to ISAT scores, last year my child had 99 Math, 95 Reading. I’ve heard from other parents that their kids’ MAP percentiles are generally lower than ISAT percentiles. So Reading very consistent. Math differs which doesn’t really surprise me. Since he was doing math above grade level, I’m sure the 4th grade ISAT were fairly easy to manage. But I don’t think he had mastery of the concepts (the RGC math goes very fast and they switched curriculums several times) so I can see where on a test like MAP that is progressive, he wouldn’t get as far as other kids who have really mastered the ideas or are naturally math-smart.) He has always had natural reading and linguistic abilities so the MAP reading score makes sense. But in our case, going with MAP would have meant no SEHS if this were the year we applied. ISAT is probably borderline for Lane. And the reading score reflects his abilities. I just still question whether this is the test to use for admissions. Am I right? No wonder MAP score is lower than ISAT. Thank you so much. Posts like yours are very much helping me get past the anxiety of an emotionally young 7th grader in a HS environment at Lane. My son went from quivering-lip when he went to school day following letters, to super excited to be one of the few who got a Lane AC acceptance at Decatur (there are about an equal number of WYAC acceptances from what info I’ve garnered, and TONS of Taft AC acceptances this year). I also read to him the list of some of the techie-geek class opportunities and his face lit up like a Xmas tree, lol. I have to keep in mind that my MPHS AC experience was in 1984-1986, and the AC concept was barely a year old at that time at MPHS, WY, Kenwood… That they’ve had 30 years to iron this out. Further, I’ve been EXCEPTIONALLY pleased with the emails from Lane offering email and phone number contacts for current AC parents, including several parents of recent Decatur Grads, and the overall welcoming feel in general. We are definitely warming up to the idea, and if I can’t have both kids in one school (they’ve literally never attended the same school, sigh…) at least Lane’s proximity to Coonley is very doable, as are their hours. Thank you everyone for the orchestra info! Just to follow up on the other info you received, WY has 4 levels of orchestra – beginner, intermediate, symphony and philharmonic (symphony and philharmonic are considered advanced honors classes). Incoming students with prior experience audition during the programming day in the spring. My 7th grader was placed into symphony, another 7th grader was put in philharmonic and others in intermediate. She’s had a wonderful experience and has enjoyed playing with the high schoolers. She continues to also play with the CYSO (as to other WYAC students), and balancing school and outside activities has been doable. Good luck. Does anyone have experience about Beaubien RGC? My son was accepted in 1st grade. Wondering how it works. Thanks! @290, glad to help! I will not be able to go to the meet & greet this week, but my daughter will be there helping out..I told her to look for you and J to say Hi. Anyone else willing to share their child’s MAP v. ISAT scores for 5/6/7th grade? I’ll share my kids MAP v. ISATs from spring of 4th grade. ISAT were 93/96 and MAP was 98/98. In the past reading has been as high as 99 and math has been as low as 82– so it really depends on how she will perform on that particular day. We had her take the gifted test this year for practice and she ended up with a 133. She came out of the test saying it was hard and gave her a headache so we were presently surprised. If her grades and MAP #’s hold up we will likely sign her up for Selective Prep next year. I It looks like for those in tier 4 that a 133 is not high enough for Lane or Whitney, so she’ll need to improve on that score. @297 Is your daughter as neighbor school now? So far I know, the test 4th grader took is CogAt which is different from AC entrance test. 133 is a good score for CogAt. My daughter is in 5th grade currently and it was my understanding that the test is the same test given for 7/8th grade programs. From what she mentioned it seemed the same as the tests her older sister took a few years back. For what its worth her scores over the years went from mid 120’s (entering K), to 139 (entering 4th), and now to the 133. I think it might be the same test too. My 4th grader (testing this year for 5th grade entry) and 6th grader (accepted LTAC) compared notes and it appears they had the same type of questions. I’m a catholic school parent who is stressing about getting my 5th grader signed up for the May MAP testing dates. Does anyone know if those dates are published yet? Also does anyone have any resources to get experience taking a MAP test? His Terra Novas have been in the high 90s but he’s never taking a test electronically before. WYACmom, if you are still here, do you mind tell me what they are doing in Orchestra WYAC selective course? Is there any music teacher teaching, or they just do rehearsal? I can’t make up my mind between ‘language’ and ‘orchestra’ as the only selective course, since the other one is ‘instructional support’ for sure. Thank you in advance. @302 The MAP test should give him no problem and in no way affect his score. It is an multiple choice test with very basic formatting, consisting of the problem, the question, and your 4 options. My kid who took it this year (he’s in 2nd grade) had no problems with it so far in regards with working with the test. My sons school sends a report that included all the administrations of the nwea. It has the RIT & a range of percentiles with 3 numbers (the actual percentile, a lower percentile & a higher one). It also breaks out the categories tested within reading & math which will state something like hi hi-avg avg low avg etc. the school doesn’t always send them though. Sometimes I have to ask & the school will just send me my sons or print out & distribute to all parents. @305 Look for the NWEA national norming tables for 2011…that is the most updated…your child should of brought home at least 2 scores – one for reading, one for math. Make sure you compare your child’s score to the correct chart i.e. Fall, winter or Spring. Glad to be seeing these posts about ISAT vs MAP as it is a big concern of mine. My daughter scored 97/97 percentile on 5th grade ISAT. The first time I saw her MAP scores was this past January and her Winter MAP percentiles were 58% Math and 75% Reading or something like that. WAAAAY below ISAT. I know our school struggled with administering the test and told us to expect a drop as kids adjust to the format (can’t skip questions, change answers, kids less apt to use scratch paper to confirm answers, etc.) but her drop was more severe than most. As she’s in 6th grade with only one year to go before it “counts” for high school entrance criteria, I am very concerned. Did anyone else see this kind of inconsistency? She got into Taft AC and one of the main reasons I want her to accept is so we know we’ll have at least one good High School option with their IB diploma program. Assuming we don’t find that her true abilities are closer to MAP than ISAT in which case the IB program would probably be way too rigorous for her. Wish they could just be kids and not scores and numbers!!! I wish you luck and just know that if you are at a great school, your child will be fine. but yes we are right there with you with the overwhelming feeling, wish all our schools had the necessary resources to challenge every kid. 309 LTAC guarantees a HS spot at Lane, right? Take the spot now. My daughter really wants to go to LTAC, and I’m the one who is scared about the logistics, but she also had that not good MAP math score. I think in the end we will say yes, b/c she is up for the challenge, so I guess we need to be too. But more than that, I think something really special is happening at LTAC–there is an energy and excitement that is palpable. And most importantly, I have a daughter who loves all things STEM (or STEAM now, maybe not so much the math element) and in the end LANE may be the best place for her for high school and I would feel bad if she had a bad test day in 7th or 8th grade and didn’t end up getting in there or any selective high school for 9th grade. Believe me, it was never on my high school bucket list for her given its size, but I’m starting to come around to it. Does anyone know what other STEM high schools are as highly regarded with their STEM offerings? It is a heart wrenching decision and we went through it last year. Although, it was my husband and I with conflicted feelings as my son decided to to go LTAC immediately. It looks to me like your “reasons to go” far outweigh the “reasons to stay.” Your reasons to stay seem based more on nostalgia. You may want to try to take the perspective of what regrets you might have if you pass on the spot, in 2 years, in 4 years, in 6 years…… The building of HS credits starting in 7th grade can really change the trajectory for a child if they can handle the rigor. Best of luck with your decision. BTW – one year later, NO REGRETS going to LTAC. It has been an amazing year for my son in so many ways—academically, socially, maturity, responsibility, etc. A lot of work, but well worth it and he was at a top RGC. Three years ago, I had to make the same decision that you are making now- LTAC letter in hand, but knowing the sacrifice of giving up activities like the school musical and graduation. I have no regrets. LTAC was awesome. The teachers are amazing, the classes are interesting, and the community is very welcoming. And now, picking classes for Sophomore year, we have so much more freedom than the rest of the Freshmen. We get to choose our own science course and two electives. The 6-year program allows a very unique, student-driven high school experience. It is a TON of work, but it’s manageable, and it pays off. And it is hard to say goodbye to friends, but it’s so easy to make new ones at Lane. The entire experience as a whole is really worth it. I’d definitely recommend it. NW Side MOM – was there another reason you pulled your child from RGC Beaubien after 6th grade for Taft AC? Did you feel she was not going to be challanged in 7&8th grades there? We had to make the same decision 2 years ago. Oldest son at a magnet school in a gifted program since kindergarten (younger one as well). It was tough to leave friends and really good school (Thorp Academy) which was only a mile away. LTAC was his first choice. But he always wanted to go to Northside for HS. However being at LTAC was a safety net in case he doesn’t get in to Northside. He knew he would have to work hard for “A”s in 7th grade – any “B”s or bad ISATs and he was done. But he succeeded – he had all “A”s and 99,99 ISATs. This year he took the SEHS test (more because of curiosity) and with score 900 was offered a spot at Northside, which he declined. It was pretty obvious at the very beginning of 7th grade, that Lane Tech is where he wants to be. This fall he is starting HS and will be in Alpha STEM. At the same time, his younger brother is joining him at Lane as a 7th grade LTAC student. And the younger one already said that he is not taking SEHS test, since he wants to stay at Lane. Peter – such helpful info. Can you please share more about Thorp comprehensive gifted program, the teachers, where all other kids post 6th and post 8th grades went to AC , SEHS, etc. I have a son in kindergarten as we speak, but he got offered a RGC spot at Beaubien for 1st grade, trying to assess what is best for him, and where he would be challenged more, should we move him ,etc. My older son had some outstanding, very demanding teachers that unfortunately retired, but my younger son had great teachers as well. I think he is prepared to take algebra placement test at LTAC, so he gets into Honors Algebra in 7th grade. My older son had no problems scoring over 90% on that test 2 years ago. About a third of gifted program Thorp kids get into LTAC, Whitney, Taft and Kenwood academic centers. I don’t know about other 2 classes. This year from 8th grade gifted one student got into Northside, others are going to Whitney, Lane Tech, Taft, Jones, but I don’t know the percentage of those who got in. My daughter was accepted to Lane ac and she is looking forward to it. I am just very worried once she starts High school and has to take the cta bus to get to school. It will be about 1hr 20 min of commute time. Also, the neighborhoods she will pass by are not the best. I will not be able to drive her since she has a younger sibling that needs to be picked up. How do other families deal with similar situation? I am considering declining and trying for WY or Lindblom for HS (both great schools also) but she really wants to go to Lane. I could transfer her for HS. However, I am worried that her grades will go down at Lane since it is a rigorous program. Any advice? Just want to mention that the reason I want to consider WY or Lindblom is because they are great schools, plus they are both much closer to home. I could easily pick her up. Is it possible for your daughter to use the school buses provided by CPS for 7th graders who attend ACs? We live in HP and there is a girl who rides a bus that picks her up from one of the local elementary schools. Although she’s the only one that is being picked up for LTAC, she’s made friends with the kids waiting for the Lindblom bus. It might be a possibility as I agree that 7th grade is pretty young to be riding CTA alone for over an hour, particularly during the darker winter months. worriedmama, I’m an LTAC 8th grade parent and I know we have several south-side families, but I’m not sure how they will be handling transportation next year for high school. We do have a LTAC parents & friends Facebook page. Maybe try posting your question there as well? Hey, all you AC peeps, are you given a percentile when you get the AC test score? I’m going to start the AC conversation with my son, since he’s now hearing kids talk about it. I don’t know from the AC scores, what is realistic for him, just to start framing it for him. For now I’d prefer he stay at his school, but I want him to realize what the input measures are. Cpso-the AC test is just the RGC test, you can apply to both kinds of schools & just take the one test. No percentile score is given, just the score, the highest score is 150. In theory, anything 135+ is 99%, and, sigh… This year a 135 + perfect grades & Isats was not enough for WYAC from tier 4. Word is definitely out about the ac’s. Yikes, wow — so it’s sort of like the RGC test score percentiles. So that’s the rub… you basically need a 99% on that test to get in. Okay, good to know – definitely will help me frame it up to him. Thank you! Thanks everyone, for your insightful comments. We are still undecided, but it has been helpful to hear so many positives re: LTAC and also to know that others have experienced (or are currently experiencing) the same angst we are. Question regarding the “final” grades used for the AC admissions. For the first two quarters of this year, my 5th grader has had straight As. However, for the 3rd Q report card, he received two Bs, one in Writing (due to a missed assignment) and one in Science (due to a botched assignment). If he gets all As for the 4th Q, how much will these Bs affect the final grades used for AC admissions? Are the final grades just the 4th Q grades for science, reading, math and social studies? Or are they a cumulative GPA for each subject? Hopefully this makes sense. @stemmom, I just discussed this with someone tonight who said that it is a cumulative percentage for the whole year. So a very low A is different than a high A. So for instance 2 low As and 2 low Bs would probably come out as a B (ie 91/91/81/81) versus 2 high As and 2 high Bs. @cpso– Thank you! Very helpful! Also, the writing grade does not count (same as SEHS admissions). It is only reading, math, science and social studies. Yes, “final grade” means “final grade”–I know many don’t actually look at the report card distributed on the last day, but there are *5* grades for every class–each of the 4 quarters and the “final grade”. Depending on the teacher, the final grade could be the 4 quarterly grades averaged, or it could be total point percentage over the whole year (ie, if a disproportionate amount of the graded material fell in one quarter). It’s entirely conceivable that a kid could have a C in a quarter and end up with a final grade A (94, 94, 79, 94 = 92 average). So one quarter aint the end of the world. Does that policy vary across CPS? I thought for CPS it was an average of the 4 quarterly grades. There is more than one way to average 4 grades. What’s the average of 3 Bs and an A? Dunno, right? 335 also depends on the school is 92 — A at all schools? @339 At CPS, I think you do know how to average those 3 Bs and A. If you log into the CPS Parent Portal, it gives you the percentage behind those grades for each quarter. So here is a question, I was pondering as we get to this last quarter. Do CPS round up? i.e. if your 4 quarters average 89.5, and your schools says that A >= 90. Do you get the A? I noticed in the quarterly grades that they average up but does it work that way for the final grade. the school grading chart is a major problem…when will CPA institute same numbers/same grades in all schools? Right, so you don’t know. Also, if, for whatever reason, Q1, Q2, and Q4 all have a max of 200 points on the graded material, and Q3 has 400, is it “fair” that the quarters all carry equal weight? Say the kid gets 85, 85, 100, 85–straight average that’s a B, but kid earned 910 out of 1000 points–an A (on a 90-point scale). you can flip it around, too, so 3 As and one B, or whatever. What’s “right”? As has been discussed muchly here, nope. But going back to my question, I don’t know. But maybe a parent who has been through this knows the answer. And keep in mind, the roundup only impacts those students right on the border line. For those students without a roundup issue, they do know the final grade. Your scenario on the points is a philosophical debate that we can go round and round about, and never mind throwing into the argument that at a RGC that the 1000 points is much harder to get then a school at a lower end of the CPS spectrum. Should they be evaluated the same (and no, don’t answer that question, unless someone else is up for a back and forth on that one). In case anyone’s interested: IT Summer Camp for rising middle schoolers at south side and north side locations. Video games, 3D printers, LED lights. Camp is all day long and $25 for an entire week’s session, hello? I only meant “fair” in the context of that given teacher’s class, and the relative grades of kids in that class. I’d have had a cow when I was a kid if one quarter had twice as much ‘work’ (poor assumption that points = work, but that’s how it comes across) and only counted the same as other quarters, *if* it affected my grade. Not *at all* getting into that BS about “my kid’s school is harder than your kids school”. Missed cutoff for LTAC by one point. Wondering how many others are in the same boat. . .
We are torn between Taft AC and Disney II for 7th grade spot. They both have great curriculum but offer something very different in terms of future options, culture and proximity. Great options…anyone with opinions? 349 Disney II…You can always get back into Taft for HS (if you have too). @319 Levski: My daughter wanted to try something different, so we let her move to Taft in 8th grade. She definitely did not need to be more challenged – I think Beaubien RGC is as challenging asTaft AC. I’m guessing that your real question is what we thought about Beaubien, and after having two children go through Beaubien RGC, I can say that we have been very happy with the program. I think both of my children are well prepared for high school/AC. They both did extremely well on their ISATS and the entrance exams for high school/AC, and as a result were able to get into their first choice of high school (Northside) and AC (Lane Tech). My kids liked their teachers (for the most part), have made a lot of good friends, and are well prepared to continue their education. I just don’t think the K-8 model is a good one: by 6th grade I think alot of kids are ready to move on to a different environment. But that’s what you have at any CPS school, not just Beaubien. FYI – we were offered but turned down a seat at Ogden Gifted IB. Lovely, balanced, well rounded, challenging program, small school, enthusiastic faculty. ( I would have gone there . ;-) Came down to the possibility of changing schools twice in 2 years – she really wants to go to LTAC. So keeping seat at Pritzker for 6th grade. If you have an option for Ogden, and are interested in my impressions let me know. @Levski, My son is in 2nd grade at Beaubien. I highly recommend the program. I’m guessing from your comments on the other thread that you would prefer Bell. My own opinion is that Beaubien is actually more desirable. Bell has suffered from major budget cuts that Beaubien has not experienced. At Bell the foreign language, Chinese, is only through 4th grade! They have no foreign language for grades 5-8 except for an after school program! My child is challenged and interested in the Latin program at Beaubien. The new principal is outstanding. It’s a really welcoming community. I’m sure your child would thrive at Beaubien — and you might even be happy in the long run that Bell didn’t work out. expected result. This makes it much easier for individuals to move from one page to another. I’d like to comment on the idea that some schools have suffered from budget cuts and some have not. That’s baloney. ALL schools have suffered from cuts and will continue to do so even more. Some schools just use their very limited funds differently. There are a bunch of decent enough schools in Chicago and Bell and Beaubien are two of them. Relax. Can anyone point me in the direction of CPS’s grading policy that says the final grade is cumulative over four quarters. I thought it was cumulative over two quarters ending in a final semester grade. @357, I don’t need to “relax.” The reason for my comment is that it sounds like Levski is about to turn down a spot at Beaubien, hoping to get a spot at Bell (with no guarantee of getting in to Bell, of course). I wouldn’t turn down the spot at Beaubien. In addition to the foreign language being cut at Bell last year, there is no longer a Director of the Options program (she is now the regular 8th grade teacher), students no longer get art and music every semester, and so on. You are confusing HS & elementary grading. Elementary is 4 quarters averaged & HS is 2 quarters averaged into a semester grade. I am sure if you go to cps.edu & do a search of policies you will find the grading policy. @360 Thanks. I’ll look for it. Dose anyone receive the 2nd round offer from RGC or classical? Sorry…to clarify…anyone get 2nd round offers yet? Bumping this up. Has anyone heard of 2nd round letters going out for Taft? Medical College Admission spotlight your medical admission counselling in professional Medical colleges in tamilnadu MBBS admission mainly in the form of medical education, since we runnig our admission guidance in the name of Bridge Consultants in Chennai from 2006,here we list out the colleges we provides you the admission guidance for 2014-15 in and around tamilnadu. I just answered a robo call for a seat at Lincoln IG. The deadline to accept/deny is Tuesday, May 6th. A letter and email is to follow. Is anyone getting calls or letters from Taft AC? Rec’d e-mail and call from oae at 3pm Tues 4/29 for 2nd round at Taft AC. Official letter came in mail yesterday. We are tier 4 and my child originally missed the tier 4 cut-off by a mere .2 points. We accepted seat. We received a call and letter from Taft AC, but decided to take a pass and release the spot for someone else. I have heard from other parents with children there that the curriculum is not that challenging. @373 can I ask where your child currently attends? @NWsider what is your current school? My daughter is at Edgebrook and we’re looking to connect with her new Taft classmates over the summer. Is the ogden international gifted program considered an academic center since it takes kids at 6th grade and feeds into the Ogden gifted High school progam? @377 – The IG and AC programs are both selective enrollment middle school programs. The ACs are 7-8th grades and affiliated with SEHS, whereas the 2 IG programs are 6-8 and housed within K-8 schools. The Ogden high school is an IB program. You are partly correct. Taft AC and Kenwood AC do not have SEHS attached to them. You can automatically stay for H.S. and their are options (Taft has IB for H.S. and Kenwood has some cool programs with U of Chicago), but they are not SEHS. Lane and WY have ACs and are SEHs. I just answered a robo call for a seat at Lincoln IG. The deadline to accept/deny is Thursday May 15.A letter and email is to follow. We just received acceptance to 7th grade Lincoln Ig. I do not think Lincoln gives you automatic admission to LPHigh school does it? Can you delete that post about lp Ig and hs- did not want to use real name! I need some info on Lincoln IG. Anyone with experience there? What is the administration like? What is the community like? Good learning environment? Good teachers? Any insight is welcome. @384. I attended the Lincoln IG open house for parents in the fall. If “I ” were going back to school, I’d love to go to Lincoln; if my DD were not set on the AC at Lane – I’d send her there. I think there are some great things to recommend Lincoln IG. The principal seems to be very on top of curriculum. They use Socratic method for presentations and research and Cornell note taking method; have French as world language. (Truly things my dd “needs”) Learning environment seemed great. Feeds IB at Lincoln Park HS. Students I spoke with seemed very happy. Building older, charming and cramped but getting (some what controversial but needed) annex/addition. Seemed less “diverse” than other schools we looked at. School is K-8, so 8th graders must test again for HS; vs AC’s which leave your middle schooler set for HS if they choose to stay. All that said – we got a call today too offering Lincoln seat. Again, I had dd test to “practice” for this fall. Rising 6th grader at RGC. Tier 4, 150 test, 99/96, 866.6. We will decline and shoot for LTAC next year. Lincoln IG versus WY AC ? Any hints? have until Thursday to accept Taft offer. To all parents who are choosing Taft, what did you think when you went to the meeting. Impressed? Underwhelmed? We have a good school he is at, so decision is not easy! 1. The curriculum is more challenging than his current magnet. Although I have read on this blog that some SEES kids find is unchallenging. I like it and he will be surrounded by kids that mostly want to do good in school, rather than him being 1 of a few kids. 2. He’s itchy for a change of scenery. He doesn’t want to go to assemblies with “little kids” anymore and doesn’t want to have to line up on the playground anymore. He’s also just looking forward to making new friends. 3. When we toured, he was really impressed that the kids he spoke to were smart, but also seemed really happy with their extracurriculars. The kids said they had a lot of homework, but it was manageable. This was different from his impression of other academic centers and the work/life balance thing is pretty important to him. 5. The open house was not very helpful for me, given that I wanted to meet all the teachers and talk about their curriculum. He, however, was happy that he met the Language Arts and Math teachers, and liked how they talked to him. I have since emailed the teachers to get a sense of what they are teaching next year. 6. My only worry is that he does not want to go to Taft for High School, which means 7th grade is particularly worrisome. Not only will he have to navigate a new school and new friends, but keep all A’s with a new set of teachers. But I’m hoping he steps up to this challenge and does well. There is a lot on this blog about Taft AC…overall it seems to be a nice balanced place that gives the kids a good “middle school” experience without asking them to give up their lives! Good luck with your decision. haven’t heard of any LTAC offers after first round — did they make any 2nd/3rd round offers? Or has it become like WYAC, with no offers after the initial mailing? @388 Thank you so much for that info. Sounds like you and I have the EXACT same pros and cons for Taft. Number 1, well I agree on this one completely. My son also has about 5 of his good friends going too. All nice boys and are all more “intellectual and studious” even while still being well rounded! My son also feels ready for a more mature environment. Obviously I was not able to tour, but feel confident after chatting with one teacher and the AC counselor who was very kind in answering all of my questions. While I think that it will be great to make him more high school ready, I am also concerned about the adjustment and 7th grade final grades. I have been told by his current teachers that he should not have trouble anywhere but you never know. He too would say he is not planning on staying for Taft IB, but who knows – he may just love it so much that he wants to stay, which would be great as I would not have to play the dreaded high school game for a third time! Thanks again for the feedback. We sent the confirmation letter in today so we will be there in the fall. He is very excited and that is what matters most! @389 I would be surprised if LTAC had 2nd round offers. I’m pretty sure OAE “overbooks” in the first round so they don’t need to do additional rounds, much like SEHS. For those who applied to Taft AC for 8th grade, just heard they are adding a 4th 8th grade class versus just filling empty spots. This is for Fall 2014. Offers are already being extended. @392 were there originally 3 classes of 33 kids? Or how does it work? How many kids in the 7th grade? Yes, they only accepted 3 classes for 7th last year (class will be in 8th in fall 2014) and now they are adding a brand new 4th class just for 8th grade. So conflicted! All of my daughters’ friends that were accepted to Taft have turned it down. We are in a very good K-8 but still feel there are many advantages to Taft AC. Are there any girls headed to Taft AC next year from NW side grammar schools? If we decide to stick it out, would love to meet up with others this summer so she has some familiar faces. Beaubien RGC 1st graders parents for 2014-2015 – we are starting a Facebook group for incoming families. If you would like to network, get to know each other, please join us! Just heard from a friend that got an offer to Ogden IB 6th grade on FRIDAY! Has until Tuesday to decide. Would rather go to Lincoln. Any one know if Lincoln is full? My daughter applied for Kenwood’s AC (7th grade) and didn’t get in. Her scores were low enough that we knew there was no chance for a later round offer. I received a letter in the mail from CPS today listing selective enrollment schools and the grades for which they still have openings. If we return the form with our choices ranked they’ll use her earlier test score to determine if there’s a spot. 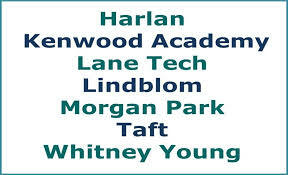 There are two ACs on this list – Morgan Park and Harlan. All of the other openings are for the later grades in each school – fifth through eighth for Beasley, fifth and sixth for Carnegie, fifth and sixth for Poe and then seventh and eighth for the others. Poe was the only classical school on the list. The rest are regional gifted centers. My son got accepted to Taft AC…. but, he has to go to summer school because he really screwed up this year….D’s and F’s in Reading and Social studies on his report card. He was not doing his assignments. He does not seem to be self motivated. Are there any AC parents that have had to do”hand holding” to push their kids or will he have to be self motivated to survive in this school. @400: My son was accepted to Taft in the first round. He is mostly an A student…the curriculum is a lot more challenging than what he’s getting at his Magnet School now. I’ve looked through the website to get a sense of where he’ll need support. Perhaps you should do that and see if the classes are a good fit. 400 how does a D /F student get into Taft AC? How is that possible? Because it is the 5th grade final report card that counts. What happens in 6th grade doesn’t count other than successfully completing 6th grade. So something changed between 5th and 6th for that child in their results this year. @ 19th ward mom…U r right….I don’t wanna lose faith in him, I hope it’s just a phase. I know that this isn’t about what he DIDN’T know. He’s telling me he really wants to be there and that things will get better when he goes. Does anybody else have to check and make sure that their kid’s homework is done or are your children all self motivated enough to do it on their own? Hang in there. I have two students, one that got straight A’s this year and I have to do no hand holding. But just 3 years ago, she also pulling a D or two, and it was a constant back and forth to get her to pull up her grades. Finally after the 3rd quarter, I told her she wasn’t going to summer camp and miraculous the grades came up. Haven’t had a problem since. My 7th grader this year, I had to constantly hand hold, and log onto the teacher’s website to see what was due. If I hadn’t done it, I don’t know what grades we would have ended up with. This same child mentions wanting to go to Payton, and I am trying to discourage that. I think Payton is better suited for someone who is self-motivated. Maybe talk to your school counselor and get their opinion. I am sure they have experience with the different types of kids that do well at ACs and those that don’t. Too bad the school year is over tomorrow, or I would also suggest having the child talk with the school counselor to see if they can get some ideas of what happened this year. @19Th ward mom….Thanks for your input…I’m glad someone else can relate. It looks like I’m going to have to become really good friends with cpsparentportal. I thought he was the only one. I was constantly thinking to myself, “how could he be so smart, but have no drive?” I’m gonna ride it out with him them. Thanks for the encouragement! We received an offer a couple weeks ago to Lincoln 7th grade, which we declined. We also just received an offer to Ogden, which we also declined. If these programs had been on my radar for 6th grade we might have been more interested. Unfortunately attending Lincoln as an out of neighborhood student doesn’t give you an edge for Lincoln Park HS admission. And I’m just not familiar enough with Ogden HS. @sonomom, are you going to give Morgan Park or Harlan a try? My child received an offer to 6th grade Ogden through robocall last night. We almost didn’t pick up the phone as we’ve been getting so many CPS robocalls the past few days about free lunch etc. I don’t remember her score but she did have a B in 4th grade. I think her test score was a 138 or 139? Not sure how useful this chart really is, as the MAP tests were not high stakes tests when they were taken for this comparison, but here is a link to last year’s MAP score minimums for AC entry by rank and tier. Get lots of energy to work out and run with vegan supplement bars like Luna and Cliff.